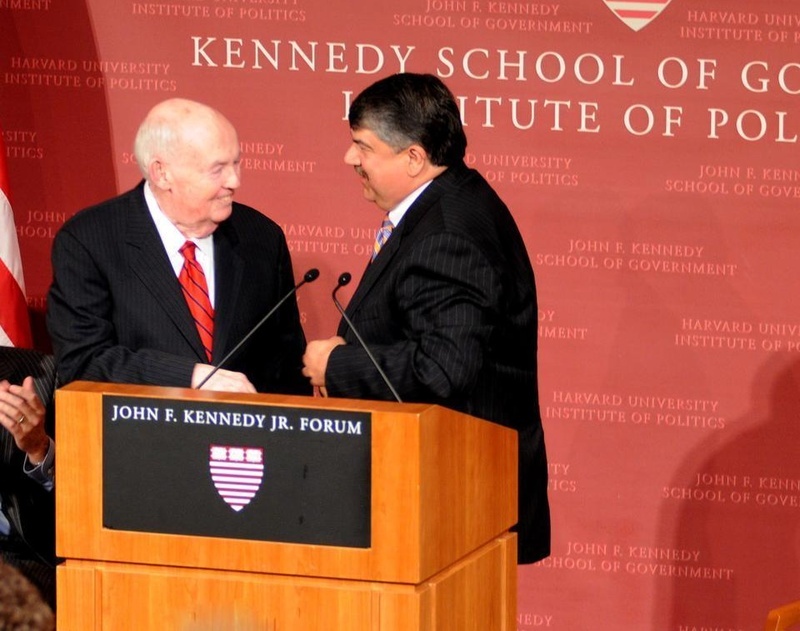 AFL-CIO President Emeritus John Sweeney introduces current AFL-CIO President Richard Trumka at the IOP forum yesterday evening. American workers are angry, and the labor movement ought to form alliances across socioeconomic groups to prevent this anger from turning into hatred, President of the AFL-CIO Richard Trumka said at an Institute of Politics forum last night. Trumka—who spoke earlier in the day at the study group of his AFL-CIO predecessor, current IOP Resident Fellow John Sweeney—said that the labor movement provides necessary organization and political voice for workers who do not feel the system is on their side. Trumka also emphasized the importance of the labor movement in rebuilding the strained U.S. economy. According to Trumka, the American Federation of Labor and Congress of Industrial Organizations is working to show younger generations of workers that the labor movement can be key to addressing several of their needs, ranging from health care to justice for undocumented workers to workplace safety. He added that the AFL-CIO has been active in each of these areas. Trumka’s emphasis on workplace safety came in the wake of a mine collapse on Monday in West Virginia, which killed 25 workers. Trumka, a former miner and former president of the United Mine Workers, said that the tragedy should encourage the strengthening of worker safety laws. After opening the discussion to questions from attendees, Trumka directly grappled with the question of racism in America. Andrew J. Breitbart, an editor at the Drudge Report who was a guest at IOP Fellow Ernest Istook’s study group yesterday, questioned the recent allegations of racism in the Tea Party movement. While the question riled up the audience with cries of “next question,” audience member Kevin E. Kelley—a member of the Carpenter’s Union—said that Trumka’s diplomatic handling of the situation is representative of his strong leadership style. The event, co-sponsored by the Kennedy School’s Malcolm Wiener Center for Social Policy, attracted union members from across the Boston area. Karen Jeanne O’Donnell, a union electrician who has worked at projects at the Harvard Business School and Adams House, said that she was disappointed that Trumka did not address the role of women workers, but she was “hopeful and energized” after hearing his plans to reach out across age and socioeconomic lines.